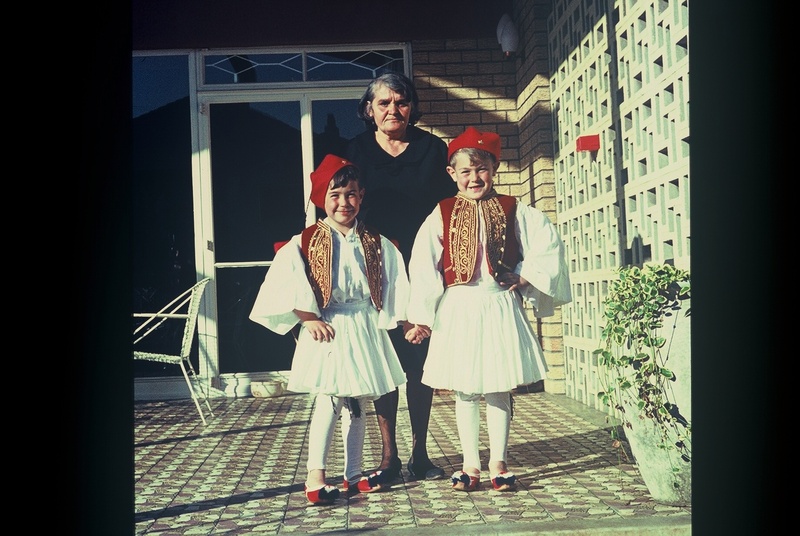 As I look back at my writing about my father on this blog it is apparent he was very Greek. Many of the stories are set in Greece, or concern Greek tradition, or revolve around the local Greek community, the Greek Federations of Communities, or SAHETI and the Bank of Athens. It is amazing that someone can be borne in a country and live there for 72 years and spend at most say five years out of that country in another, and yet in their reflection, the five years is all you see. I suppose one of the reasons is almost genetic. There are some Greek things that move me to feel Greek: a great song by Dalaras, the National Anthem, a simple greeting, and a good tiropita. I cannot explain it other than to say sometimes I just feel Greek. The other reason is an almost romantic dream that was woven by my father’s parents. His father told him all about the village, and his cousin Piet, who like my father’s father never returned to Greece, told him details of the village even forty years later, of trees and roads and houses and people that enticed my father to return. Then there is a sense of displacement. When Greeks arrived in South Africa under Apartheid they were not really wanted by the government, who was looking for Calvinist Europeans, not Catholics (as the Orthodox Greeks were referred to). So the Greeks and Italians were second class citizens and were forced to stick together. Most could not speak English or Afrikaans and were excluded from socialising and participating in business ventures. So they started up small stores and worked long hours, slowly weaving their way into the foreign community. Their children attended school and university and were often regarded as strange. The children came from strict families, were dressed as nerds, were generally polite and formal and just did not seem to fit in. When democracy arrived in South Africa and the Greeks were settled and successful many felt a new power of displacement. The threat of Kenya, Ethiopia, Uganda and Zimbabwe loomed large and they gathered their Greekness and left for Greece or Australia or the States, where they melted into the Greek community there. we hardly celebrated Ester with the rest of the world. We always had the Romans crucify Christ at a different time, and then we coupled it with a fast of no animal products so we all smelt of garlic at school and work. This Lenten passion drove us far away yet in itself is one of the most Greek events anyone can experience. The Easter Service dates back to ancient Greek pagan festivals of light at the end of winter, when spring is born. So if I wrote about my African or South African culture I would struggle, for the stories would be anecdotes without roots. I have no roots here other than the fact that this is the Cradle of Mankind.